When students work with Crayola Educational Watercolors, each brilliant color retains its richness without muddying or fading. Pigments stay true from the darkest dark to the palest washes. The natural hair brush delivers a smooth flow of paint every time. Sets are packaged in durable white plastic boxes with divided lids for mixing. Refills are available to replace those colors used most frequently. 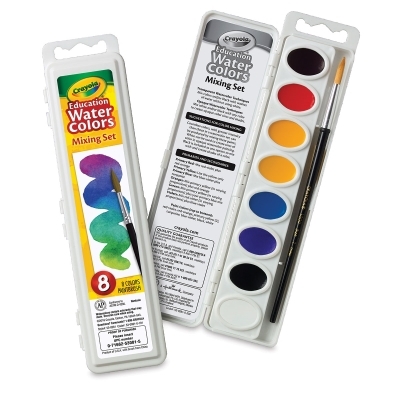 Each refill package contains one color per box. 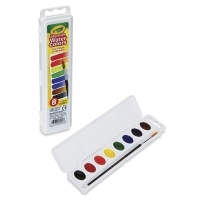 Set of 8 Colors — Colors include Red, Orange, Yellow, Blue, Violet, Green, Brown, and Black. Includes a #7 brush. 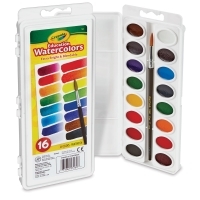 Set of 16 Colors — Eight colors above plus White, Red-Orange, Yellow-Orange, Yellow-Green, Turquoise Blue, Blue-Green, Blue-Violet, and Magenta. Includes a #7 brush. Oval Pan Refills — Oval pans measure 1" × 1¼". Each package contains six, all one color. Watercolor Classpack Set — This convenient Classpack includes 24 Sets of 8 Colors (described above), plus 12, 8-Color Oval Pan Refills. Set of 8 Mixing Colors — This set includes 8 oval pans in Red-Violet, Red-Orange, two Primary Yellows, Turquoise Blue, Blue-Violet, Black, and White. Comes with a #7 brush.